Last week, in our ongoing examination of the AP Poll, we looked at teams pollsters probably should have ranked. This week, we are going to look at teams the pollsters probably over-rated. Once again the numbers we will be comparing are the final rankings from the AP Poll and the SRS rankings. For a primer on SRS, follow this link. 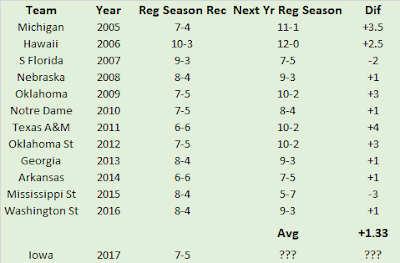 Since 2005, which teams have seen the biggest positive disparity between their final AP ranking and their SRS ranking (i.e. were ranked too high)? Glad you asked. The top-ten (actually 13) are listed below. Using this methodology, Louisville finishes as the most over-rated team since 2005. The Cardinals won the final Big East football title and then upset a one-loss Florida team in the Sugar Bowl to finish in the top-fifteen. That plus the fact that the team was quarterbacked by Teddy Bridgewater and coached by Charlie Strong is what most people will remember. Fewer people will remember that this team also lost at home to Connecticut. 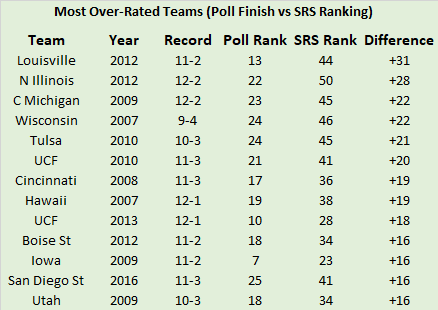 The SRS has a much better memory than most people and thus incorporates the Connecticut loss as well as the blowout loss to Syracuse and a host of unimpressive wins (like the four-point victory against winless Southern Miss) into the Cardinals’ final ranking. While Louisville was technically a member of a ‘major’ conference in 2012, eight of the thirteen over-rated team played in non-BCS or Group of Five conferences. Two teams played in the Big East, the weakest BCS conference, one team played in the AAC which owned the Big East’s grandfathered BCS bid for one season, and only two played in a current Power Five conference (Iowa and Wisconsin). I’m a mid-major apologist, but if you want to make the argument that mid-major teams are over-rated by the final AP Poll, well, I think you have a decent case. Another common trait of these over-rated teams is that they tended to finish in the lower reaches of the poll. The thirteen teams combined for an average finish of about 18.5. If we remove Iowa (top-ten finish) from the equation, the average drops an additional spot to 19.5. Finally nine of the thirteen over-rated teams won their respective conference (or at least finished tied for first). So, if you want an easy shorthand for determining the most over-rated team in the final AP Poll of the upcoming college football season, look for a mid-major conference champion ranked 19th or lower. And smugly think to yourself how much better a five-loss SEC team would look in their place. Last summer we looked at a few aspects of the AP Poll. We examined how often each Power Five team appeared in the preseason and postseason AP Polls and which teams over or under-achieved based on their initial positioning in the AP Poll. This summer, we’re going to examine a few more aspects of the AP Poll. If you want to catch up on last year’s Pulitzer worthy posts, click on the highlighted text in the preceding sentences. You can enjoy these posts without reading those, but this post isn’t going anywhere so if you want to read them for the first time or get reacquainted, feel free. As the title of this post explicitly states, this week we are going to look at the best team to not finish ranked each season since 2005. How should we define best? Instead of using won/loss record, I decided to be a little more thorough and use SRS (Simple Rating System). SRS is easily to calculate and for a given team, tells us how many point better (or worse) they are than an average team. So, a team with an SRS of 7.00 is a touchdown better than a theoretical average team. You can read more about the calculation here. Let’s get the ball rolling with chronologically 2005. 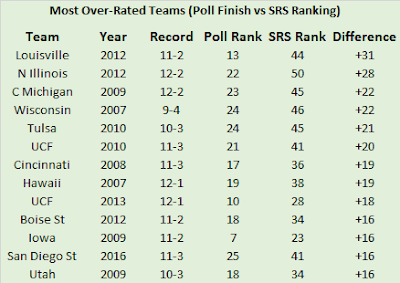 I was surprised Michigan ranked as highly as they did in the SRS considering the Wolverines finished with five losses. Obviously, a team with five losses rarely finishes ranked, but the Wolverines were better than their 7-5 record. All five of their losses came by seven points or less (21 total points) while four of their seven wins came by at least sixteen points. The Wolverines didn’t have a lot of great wins, but they were the only team to beat Penn State and in doing so helped the BCS stave off another controversy. Had the Wolverines lost to the Nittany Lions, we would have been looking at a second consecutive season with three unbeaten BCS conference teams vying for two slots in the national title game. June Jones’ penultimate Hawaii team lost three times with each loss coming by eight points or less. The Warrior lost two of their first three to Alabama and Boise State (remember the Broncos finished unbeaten in 2006) then won nine in a row before dropping their regular season finale to Oregon State (back when the Beavers were still a good team). They rebounded to crush Arizona State in the Hawaii Bowl, giving them two wins against BCS conference teams (also beat Purdue). Outside of Boise, their WAC schedule was not that formidable, but six of their seven conference wins came by double-digits. The Bulls went from being ranked number two to outside of the polls in two and a half months. Prior to their no-show in the Sun Bowl against Oregon, South Florida was at least competitive in all their losses. Beginning with a Thursday night loss at Rutgers, the Bulls dropped three games in sixteen days by a combined fifteen points. Their best wins in 2007 came at Auburn and in Tampa against West Virginia. 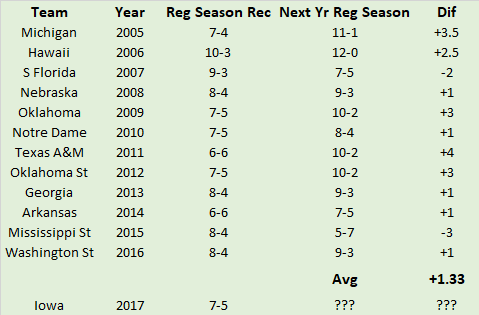 Bo Pelini’s first Nebraska team did not break into the AP top 25 at all in 2008 (one of only three teams on our list to never sniff a ranking). The Cornhuskers lost tight games to Virginia Tech and Texas Tech, but blowout losses at the hands of Missouri and Oklahoma probably kept them off the pollsters’ collective radar. Until their bowl victory against Clemson, Nebraska only beat two teams that finished with a winning record (Western Michigan and can you believe it, Kansas). They did close the year winning six of seven, but that wasn’t enough to land them in the polls. From preseason number three to also ran. The Sooners lost three of their first six game with the margin of defeat totaling five points. Each game came away from Norman against a bowl team (BYU, Miami, and Texas). After sweeping the Kansas schools, the Sooners appeared to have righted the ship, but lost two of their next three against Nebraska (close) and Texas Tech (not so much). They did finish the year by beating a par of ranked teams (Oklahoma State and Stanford in the Sun Bowl), but it wasn’t enough to get them back in the polls. Brian Kelly’s first year in South Bend featured five losses with two of them coming against mid-major teams (Navy and Tulsa). After the Tulsa loss dropped the Irish to 4-5, they closed strong, winning their last four by a combined 69 points (somewhere Gronkowski is smiling). Navy and Tulsa were actually pretty strong in 2010, coming for 19 wins and both ranking in the SRS top-50, so the Irish were probably better than most five loss teams. Texas A&M was insanely unlucky in 2011. That was bad news for Mike Sherman, who was fired, but great news for Kevin Sumlin, who was hired. The Aggies lost six games with five coming by a touchdown or less. Three of those closes losses came against teams that finished in the top 20 of the final poll and the SRS (Arkansas, Kansas State, and Oklahoma State). The other two came against bowl teams Missouri and Texas. Meanwhile, six of the Aggies seven wins came by double-digits. And let’s not forget, the Aggies also handed Baylor one of their three defeats in Robert Griffin’s Heisman season. Fresh off the best season in school history, the Cowboys were Rich Rodriguez’s first major scalp in Tucson. They also dropped three one-score conference games, but pounded bowl-bound conference mates TCU, Texas Tech, and West Virginia by a combined 81 points. In the Heart of Dallas Bowl, they annihilated an overmatched Purdue, but pollsters refused to overlook their five losses. Close road losses to Clemson, Vanderbilt, and Auburn, as well as a tight Gator Bowl loss to Nebraska conspired to keep Georgia out of the final polls. In between, the Bulldogs beat bowl teams Georgia Tech, LSU, and South Carolina. They also pounded a decent North Texas team that went on to win nine games. Alas, victories against struggling Florida and Tennessee squads failed to move the needle and the Bulldogs home loss to Missouri gave pollsters just enough reason to lock them out of the final polls. Was 2014 Arkansas the best six-loss team ever? Probably. While he never won an SEC title or a Rose Bowl, Bert can have that proudly chiseled on his oversized tombstone. The Hogs lost six conference games, with five coming by a touchdown or less including a one-point loss to Alabama on a missed extra point. If the Hogs manage to win that game, the first ever College Football Playoff would have been even more controversial as the SEC champion could have been left out entirely! Imagine the calls on Finebaum that week. When they weren’t losing close conference games, the Razorbacks bludgeoned a solid Northern Illinois team and shut out LSU and Ole Miss in consecutive weeks. They also routed Texas in the Texas Bowl. Like Nebraska circa 2008 and Notre Dame in 2010, the Hogs never sniffed the poll during the season either. One season after climbing to number one, the Bulldogs didn’t get a whole lot of respect. The Bulldogs only had one close loss (to LSU), but all the teams that beat them ended up being pretty good. Alabama, LSU, Ole Miss and Texas A&M all finished in the top 30 of the SRS with all but the Aggies finishing in the final polls as well. The Bulldogs didn’t have any great wins, but in addition to wins against bowl teams in Auburn, Arkansas, and NC State, they also beat two solid Conference USA squads (Southern Miss and Louisiana Tech) with no trouble. Sandwiched between an 0-2 start, with the first loss coming against an FCS team, and an 0-3 finish, the Cougars won eight in a row. Three of their five losses were close, and the Cougars pounded Stanford in Palo Alto, but their only other victory against a bowl team came against mighty Idaho. Take away the FCS loss and maybe the Cougars have an argument, but this is the most excusable miss for the pollsters. Every team that beat the Hawkeyes made it to a bowl with four of the five teams winning at least ten games. Three of the losses were close, and oh yeah, the Hawkeyes had one of the best wins of the year. Their bludgeoning of Ohio State probably skews their rating a little, but the Hawkeyes quietly did good work in the non-conference to bolster their resume. All three of their regular season non-conference opponents qualified for a bowl game and their in-state rival beat the two best teams in the Big 12. One thing I noticed writing the capsules for these teams was that almost all of them improved the following season. If you plan on making some bets on regular season win totals this summer (as I do), Iowa might be a good team to take the ‘Over’ on. See the table below for a summary. Ten of the twelve teams improved their regular season record the following season with five teams improving by at least two games. Iowa needs to improve their record by a single game to top their preseason win total of 7.5. Keep an eye on the Hawkeyes in 2018 as they could also be a sleeper in the Big 10 West.